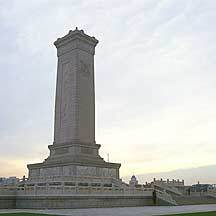 A selection of monuments and memorial structures. 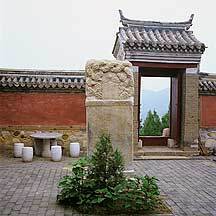 These includes historical tablets, stelas, obelisks, sculptures that were used as guardians on the 神道spirit road to tombs, monumental sculptures, statues, archways and memorial structures. All these are numerous, and many are scattered in the country. 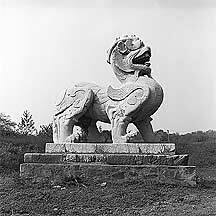 This stela is just across the road from the previous lion. 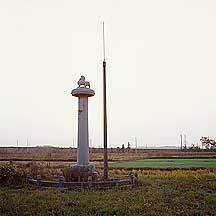 It measures 6.5 meters high and its base circle is 2.48 meter in diameter. The little stone lion perch on a Buddhist lotus pedal. 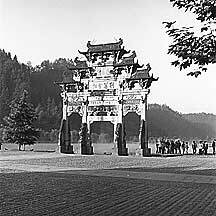 The pieces were created during the time when Buddhism was at one of its peaks. 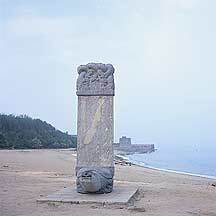 Many of the sinicised rulers were devout Buddhists. Someone or something knock off its menacing jaw. 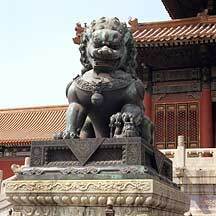 The lion's pair of wings betrays a very non-chinese mentality. 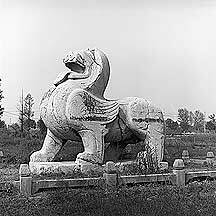 Chinese animals or mythical creatures do not need wings to fly, unless it is a bird or an animal that naturally possess wings. This is also true of immortals. While western mystical animals(such as Pagasus or a unicorn), Biblical angels(Michelangelo is exception) in general, and modern western superheroes(such as superman with his cape) requires the necessary anatomy (or a symbol such as the cape) or an external force such is propulsion in order to fly, Chinese equivalents glide through space without them. 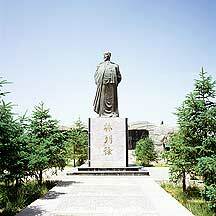 Generally speaking, this is in part due to the Chinese sense of space and time being moral(that is, mental) while that of the west is material( that is, visual). 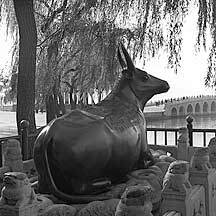 The Bronze Bull is also called the "金牛Gold Bull" because it was coated with gold. But don't rush here to scrape some because the British and French troops in 1860 and the Allied troops in 1900 had already skinned it bare. 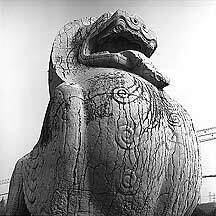 The resting bull was casted in 1755. 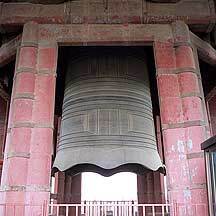 The colossal cast-iron bell is one of the three largest in China today.